South Australia’s consumer watchdog has welcomed the $12,500 penalty handed down in the Adelaide Magistrates Court to a man who admitted breaching South Australian and national consumer laws. 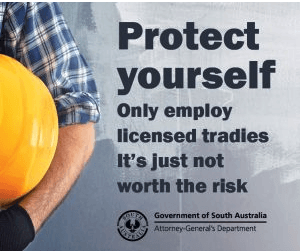 36 year old Port Willunga man David James Jackson pleaded guilty to breaches of the Building Work Contractors Act, the Australian Consumer Law and the Fair Trading Act. The Court heard that Jackson had accepted a deposit of $9630 to construct a pergola on a property in Mount Gambier and never actually started the work. Jackson had also accepted a $6000 deposit to build a veranda at another Mount Gambier property, and again failed to begin work. He also failed to deliver materials paid for by the consumers. Magistrate Bennett indicated that – were it not for Jackson’s guilty plea and inability to repay a significantly larger penalty – Jackson would have been fined $30,000. Instead, the Magistrate fined him $12,500, and made a compensation order for Jackson to repay $7550 to one of his clients. ← Is cross-laminated timber a substitute for brick, concrete & steel?